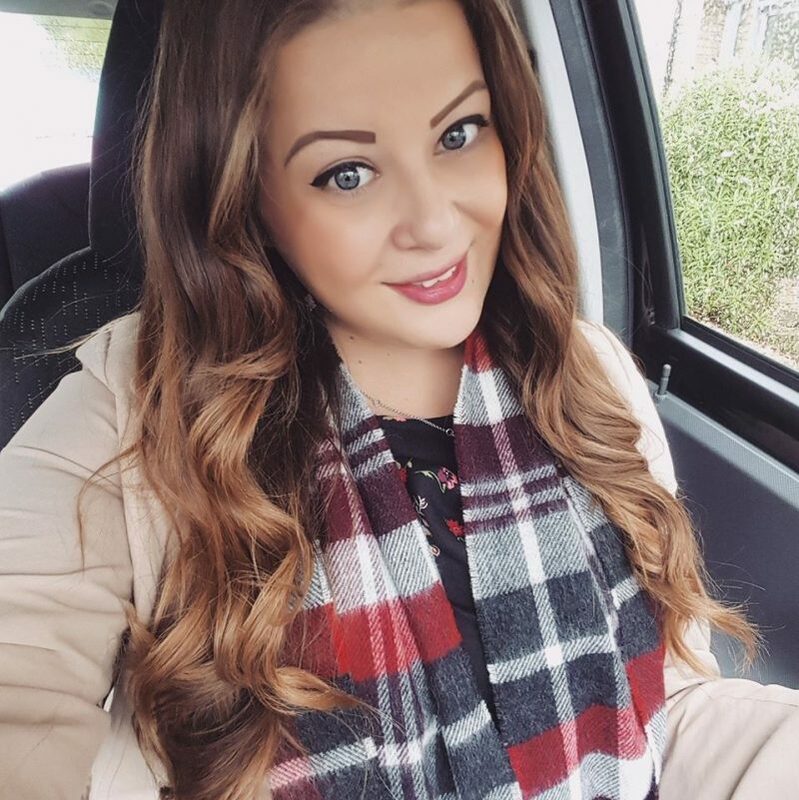 I’ve already shown you around most of my home and in my last home blog post I shared all of the before and after photos of my flat since I bought and redecorated it. 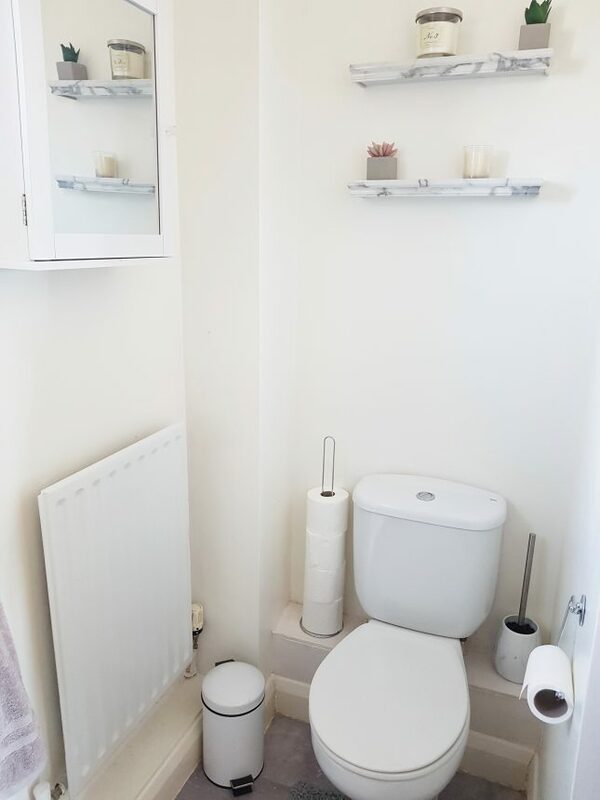 Now I’ve finally got round to taking some photos of the bathroom, so here’s a room tour of my little bathroom! It was probably the room that required the most work doing to it as when I moved in it was in need of a good freshen up, so that’s why I haven’t shared many photos of it yet! 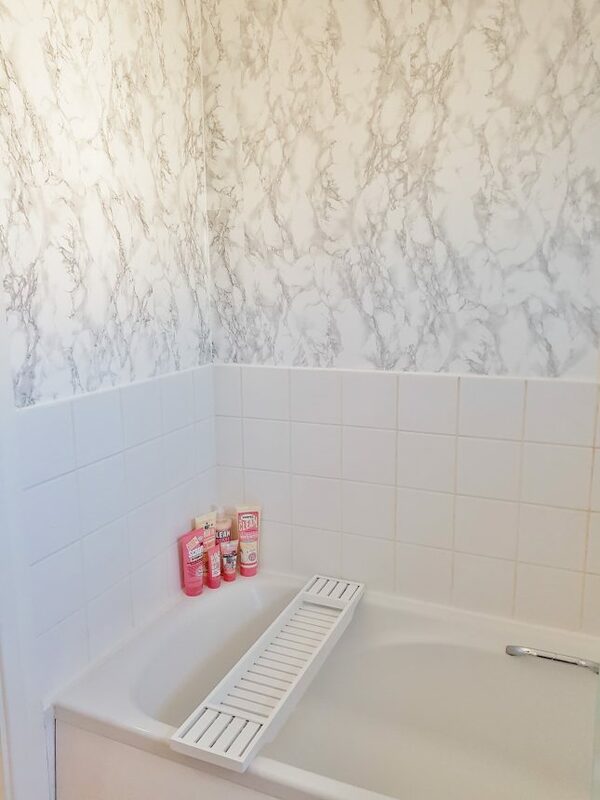 As I couldn’t get a new bath fitted I tried to spruce up the bath a little in other ways! I got a new shower head, hose, and slider rail fitted, as well as a new bath side panel so that as much of it as possible was new. I also removed the horrible shower curtain and added the wooden bath rack from Dunelm which I use to keep toiletries and pretty things on! You may have also noticed the fancy new marble wall, as for some reason that bit of wall was not fully tiled! I was a bit worried about the bare bit of wall getting damp as it’s right above the bath, so I tried to find a way to cover it with something waterproof but I wanted something more exciting than just bathroom paint. I tried to research if it was possible if to apply sticky back plastic to a bathroom wall, but I couldn’t find any positive reviews. But I gave it a try anyway as it seemed a really cheap and easy way to cover the wall and I also thought it would look pretty cool. Well, the sticky back plastic has now been up on the wall for over 6 months and is still perfectly stuck! I didn’t want to share this with you until I’d tested it out properly, but seeing as it’s still absolutely perfect, I thought I’d show you! So if you’re looking for a cheap and easy way to cover up a wall in a kitchen or bathroom, I can recommend that using sticky back plastic does work. And I would expect that it would work just as well over the top of tiles too! I used the d-c-fix marble sticky back plastic which you can buy for only £4 a roll from Wilko (although this is only 2m so you may need to buy a few rolls). 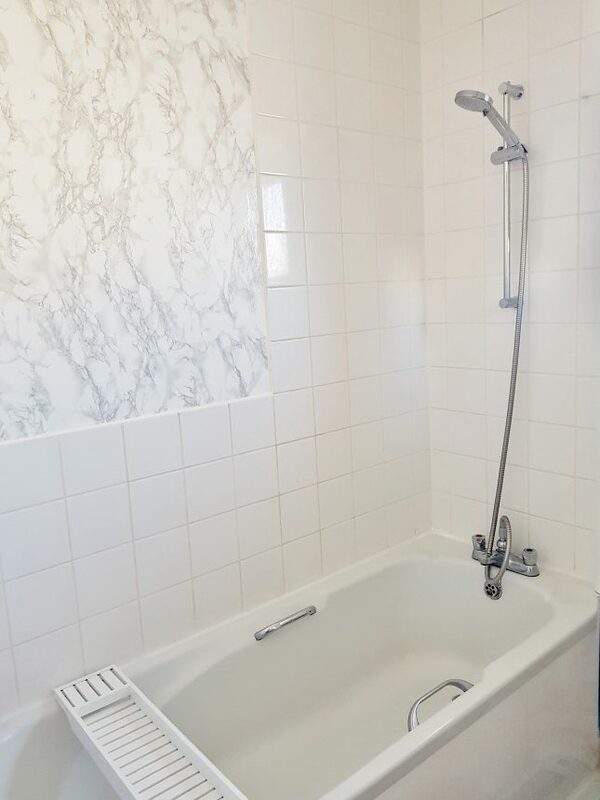 To apply we simply painted the wall with a white bathroom paint and then once dry simply stuck it on and sealed it down with a squeegee, then trimmed the edges with a scalpel blade. It would be quite tricky to apply on your own though, so I would suggest this is a two person job! And to finish off it’s probably a good idea to seal the edges with sealant so no water gets in. I’m so pleased with the finished effect! We kept the grey marble-look lino down on the floor so I decided the ‘theme’ for the bathroom would be ‘marble’. I bought these marble accessories from Matalan; the marble effect tumbler is only £3 and the soap dispenser is £4. I fill up the soap dispenser with the lovely Carex Love Hearts hand wash.. it smells so yummy and is only 93p! 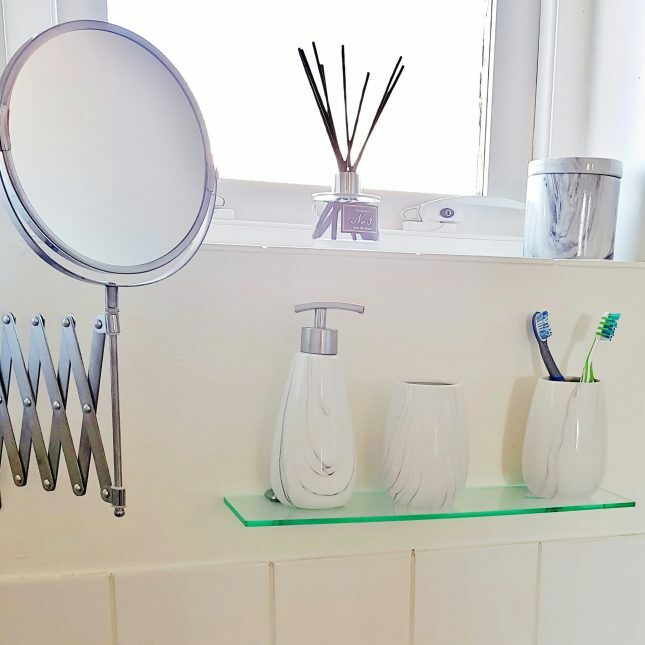 I keep them all above the basin on a glass-look shelf which is actually made from acrylic plastic and was only £7 from Amazon. It’s the perfect size to go below the window! I also found the marble effect cotton pad holder in The Range for only £2, and this sits on the windowsill alongside the Aldi luxury reed diffuser (Pomegranate Noir is my fav!). Can you believe this mirror was only £3.50 from Ikea?! 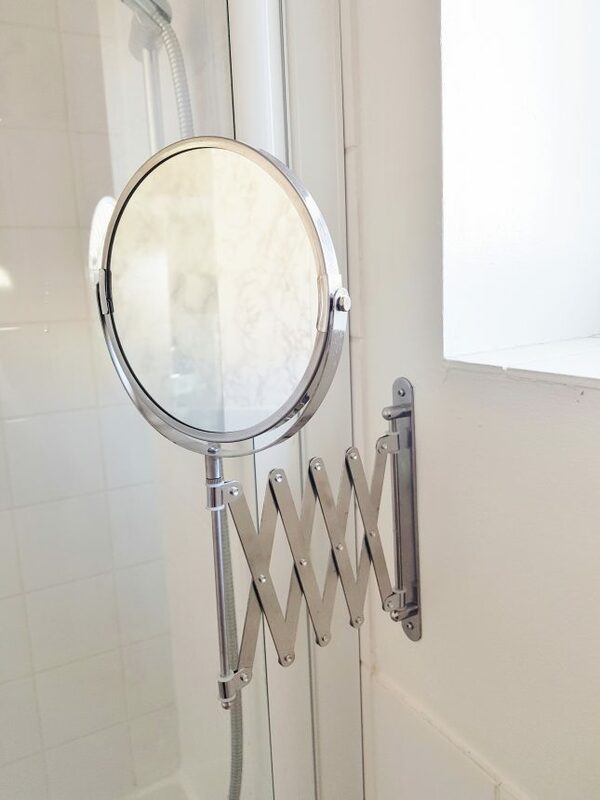 I spent ages looking for a shaving mirror on an extendible arm because there’s no space to hang a mirror on the wall as the window is right above the sink. They were all so expensive everywhere except Ikea, so this was a total bargain! Even in Dunelm a similar one was £10. 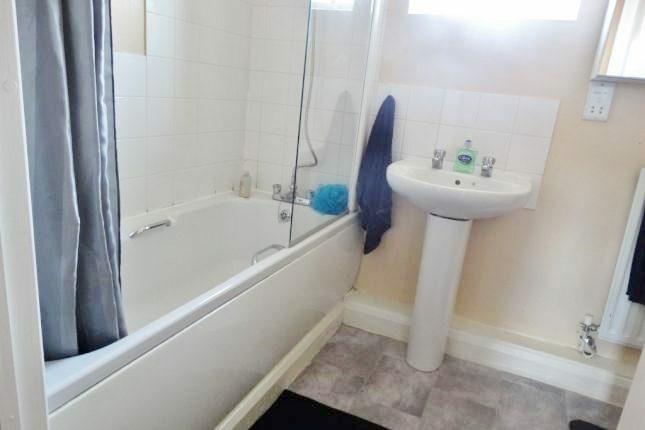 But this one fits in really neatly between the shower screen and the window and I’m so pleased to have found a way to put a mirror above the sink. Another thing that I was keen to change was the basin taps. 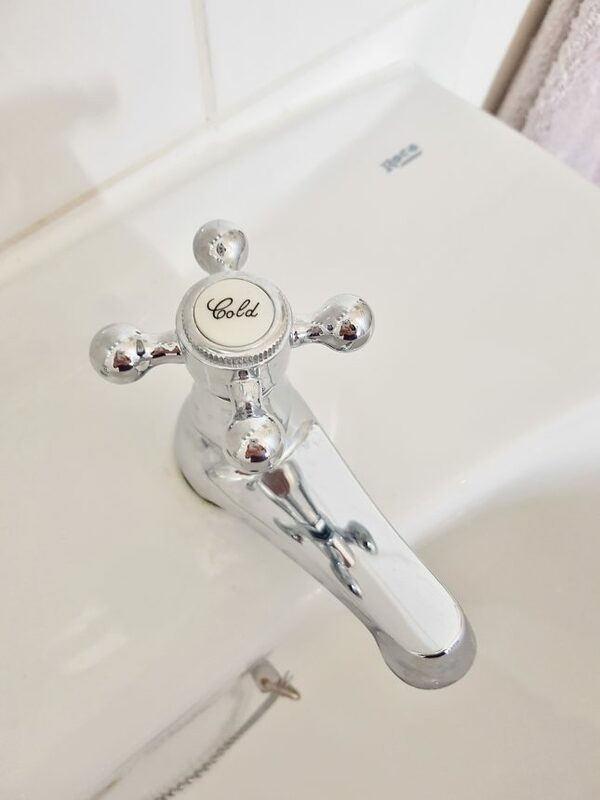 Originally the sink had really horrible cheap ones that I hated so I replaced them with some classic Victorian style chrome taps. They were only £25 from Wickes and they’ve made such a huge difference.. it feels like I have a whole new sink! I’m hoping I can do the same to the bath taps soon too, but my Dad says that’s more complicated to do.. I’m not sure if this is true or if he’s just bored of me giving him DIY jobs! The lovely grey towels were a gift from my Auntie from John Lewis and they match the decor perfectly. I found the marble edge mirror in B&M for only £4 so I just had to get it to hang above the towel rails. 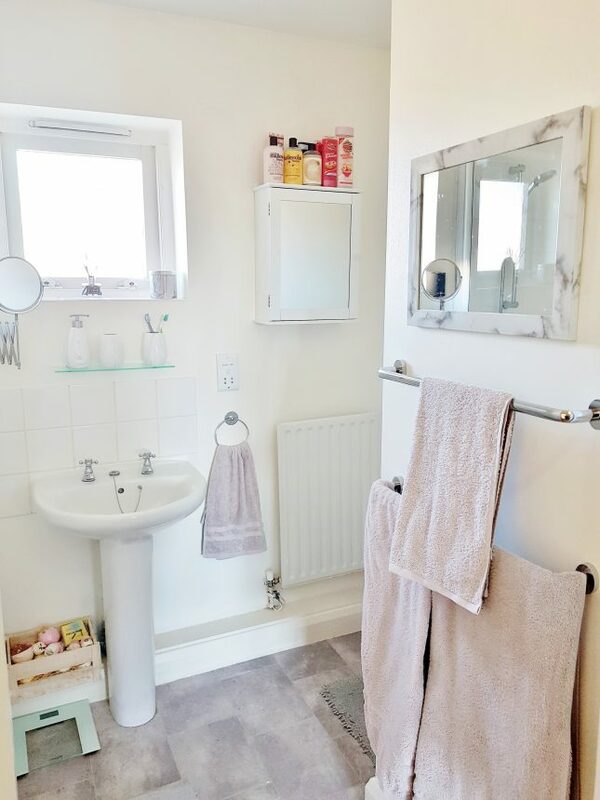 The towel rails I actually bought on eBay from China because towel rails and bathroom accessories etc are actually surprisingly expensive to buy! Even the cheapest towel rails in Wilko are around £15 each and I wanted a couple, as well as a towel ring and toilet roll holder too. I found a cheap toilet roll holder for only £2 in Wilko (total bargain!) 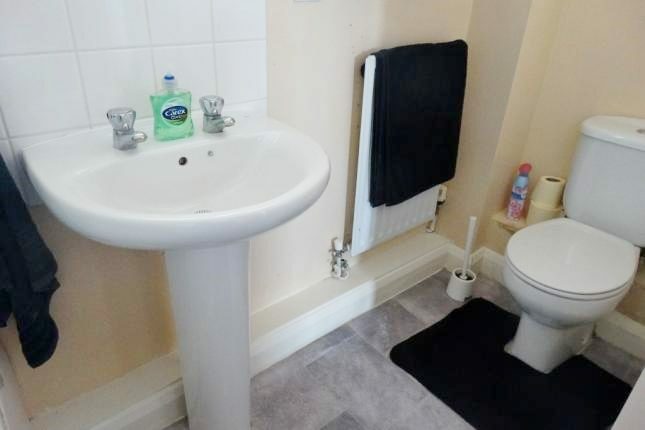 and a matching towel ring and toilet roll stand on eBay. They’re just basic chrome ones, but they do the job! 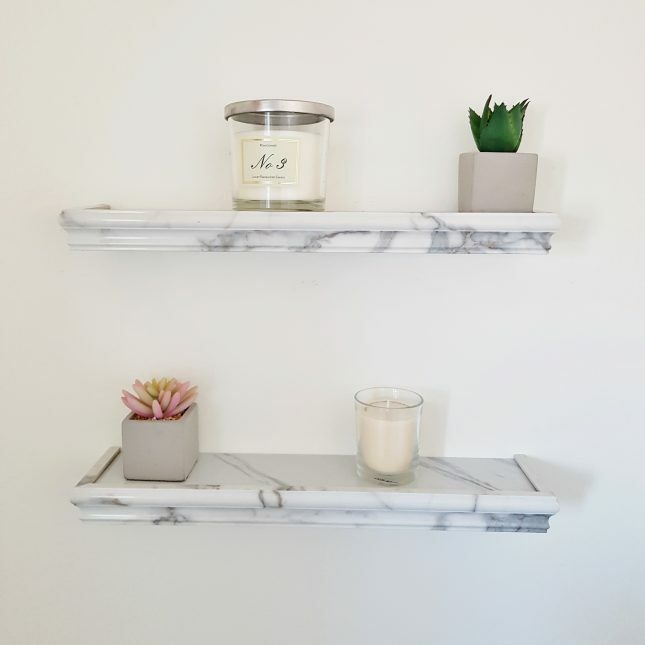 The marble shelves I bought for only £3 each in B&M and they fit perfectly on the small wall above the toilet. 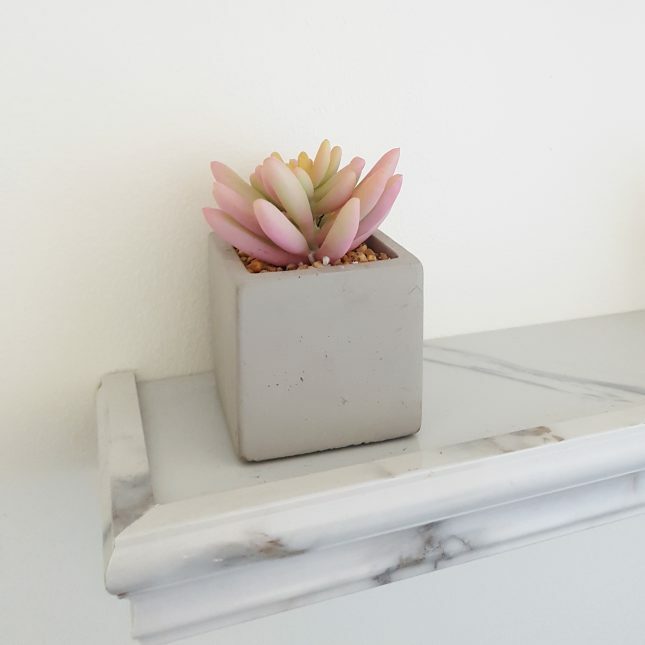 I didn’t want to over clutter them so I just put some little candles and cacti plants on them (fake.. from Primark.. obv). Oh and if you really want to know.. the marble effect toilet brush is from Matalan too! These candles from Aldi by the way are amazing.. they smell so good and are apparently Jo Malone dupes but are only £3.99 each. I found a grey bath mat in Morrisons and the pedestal mat (aka piss mat) in Poundland! The little white bin I picked up in Wilko (only £4.50!) and the lovely large white mirrored wooden bathroom cabinet I ordered from Aldi a while ago. It doesn’t take up much space up on the wall and is so handy to have. I’ve literally filled it up with toiletries that otherwise I’d have nowhere to put. I don’t really like having bottles and things lying around so it’s good to hide stuff in, although I don’t mind my favourite shower gels on display on top of the cabinet! 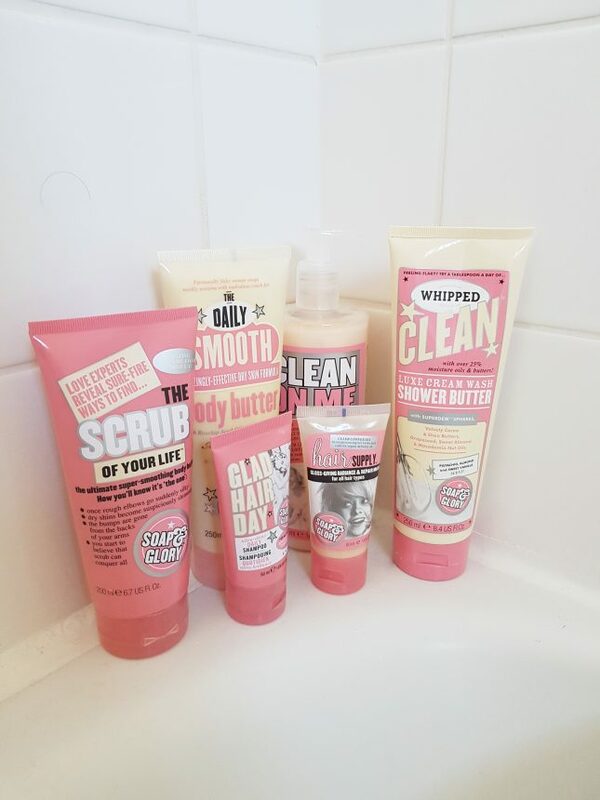 And here’s a tiny glimpse of my Soap & Glory collection! Honestly.. this is only about 3% of it ? I hope you enjoyed my bathroom bargains and room tour! Love the taps and little touches! It looks lovely! This is really amazing. I just love these touches. Thanks for sharing this post.